Back in 1978, you couldn't move, breathe or eat without hearing either 'Summer Nights' or 'You're the One That I Want' booming out of a nearby radio like some candy-floss call-to-arms - Grease was everywhere, literally and musically. At one stage and for a good year or so, the film 'Grease' was more popular than Coca-Cola, Cadillacs and Jimmy Carter, the then-President of the USA. Its two main stars, John Travolta and Olivia Newton-John seemed, on paper at least, to be the most unlikely romantic distraction for a plot centred around a pair of High School sweethearts. In reality, they proved to be THE faces of the late '70s, singing their way through all manner of hit singles that also included the weepy 'Hopelessly Devoted to You', the heartfelt 'Sandy'" and the knockabout car mechanics anthem, 'Greased Lightning'. Frankie Valli provided the excellent title song and the movie went on to challenge Travolta's other hip-wiggling vehicle, the rather more adult 'Saturday Night Fever'. Its sequel, 'Grease 2', was sadly ill-conceived and ill-fated from the start. Michelle Pfeiffer and Maxwell Caulfield replaced Travolta and Newton-John. It was similar to replacing Marathon with Snickers. Let's leave it at that. 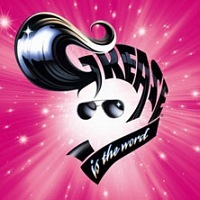 Much, much better is the award-winning stage version, Grease the Musical, which has been performed in some form or another since 1971, long before the film first appeared. Initially a play that required parental guidance (Teen pregnancy! Violence! Gangs! ), the most recent version is family-friendly and great fun. After several revivals in the US and the UK, the most recent of which was a West End residency that ran from 2007 to 2011 and inspired the TV talent-fest, 'Grease is the Word', it's time to take Grease to the regional masses at last. Currently the show is playing at the Bristol Hippodrome (sold out) and will continue to Nottingham, Northampton, Stoke-on-Trent and many more until winding up in the three newest towns added to the tour - Manchester (8th to 13th Oct 2012), Wimbledon (15th to 20th Oct) and York (29th Oct to 3rd Nov). We have tickets for these shows, priced from £11.25 to £35 for Manchester and similar for the others.